When I came up with that catchy name (we got bored just calling our “Best Vacations Ever” by the destinations included so now they all have catchy names) I was thinking that “Both Worlds” were the rain forest and the tropical dry forest. Then as I started describing our route I realized that you can visit the cloud forest at Tenorio, and there are mangrove forests near the beach, and the beach is a whole other world too. The Best of Five Worlds just sounded stupid so “both” it remains. This itinerary is a hiker and walker’s dream. Don’t get me wrong, it can be a fantastic route with great thing to see and do without walking more than a few blocks, but it’s even better if you love trails. 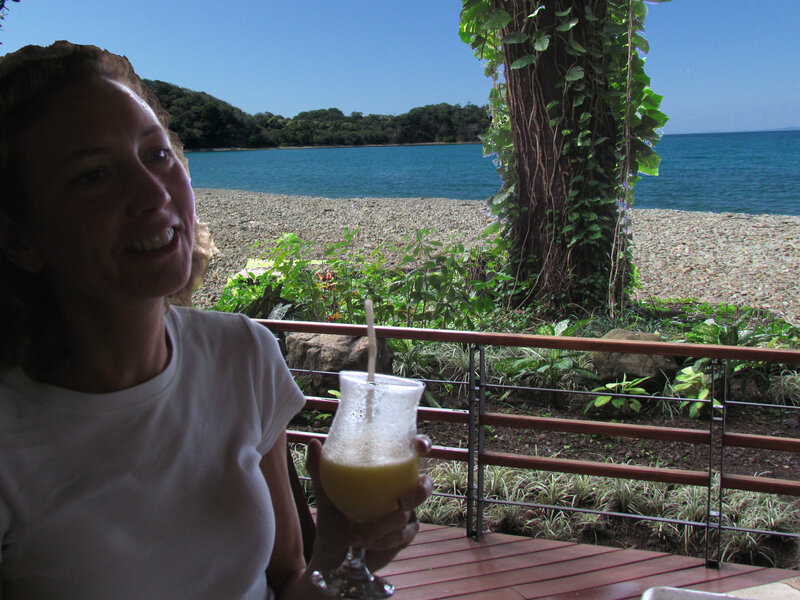 Sue and I like nothing better, and good trails are very hard to find in Costa Rica. We’ve done more or less this same itinerary four or five times. There are two things at Rincón that make it a great destination. Of course one is the National Park with its boiling mud pots, mini-geysers, waterfalls, natural hot spring pools and volcanoes with miles of trails through the dry, rain and cloud forest connecting them all. The other is the choice of lodging. There are three great places to stay here. Rincón de la Vieja Lodge is on the east side of the main road and and has simple cabins set in gardens created in what was previously a pasture and a common area and dining hall in what was previously the hacienda. What’s really fantastic about it though is the trails through their private forest reserve connecting with the national park trails just past the Lodge’s totally natural hot spring pools (about 2.5 km from the lodge). Moving up a class there’s our favorite of all. Hacienda Guachipelín is also a converted ranch but in a cushy style. Their deluxe rooms aren’t the Four Seasons but they’re large, comfortable, well designed, modern and have excellent views. Like RDLV Lodge Guachipelín has hot springs although they have developed theirs into an al fresco spa and you can drive up. Also like RDLV they have a private reserve and trails, including one along the beautiful slot canyons of the Colorado river. 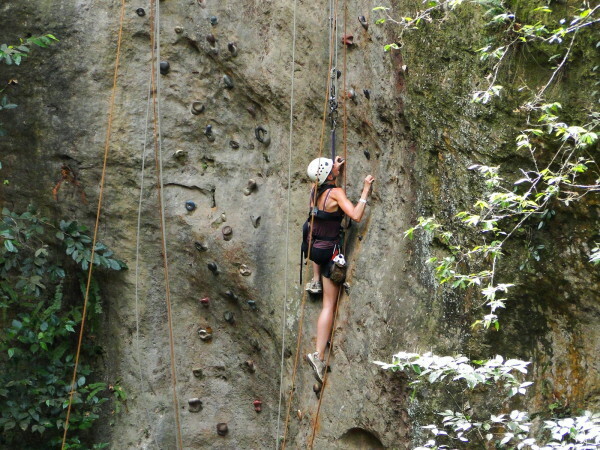 What really sets Guachipelín apart though is their Adventure Pass tour. It includes a full day of zip-lines, rock climbing, rappelling, tarzan swinging, horseback riding and once you’ve worked up a sweat waterfall jumping and inner tubing down the slot canyons. It’s simply the most fun we’ve ever had on a single tour. 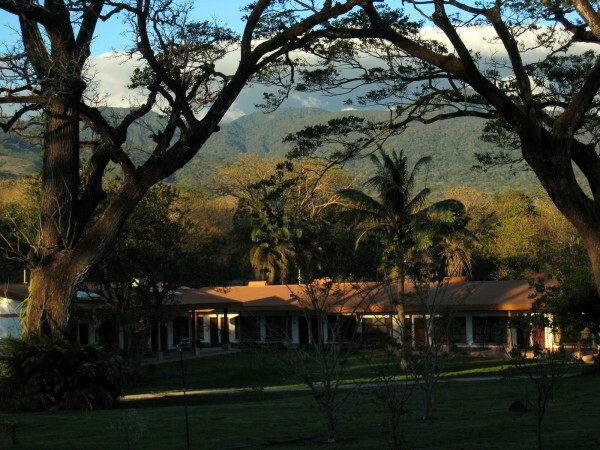 The national park campgrounds at Santa Maria station are described on the Rincón de la Vieja page. As hikers what could be better than being in a valley squeezed in between two huge National Parks? Well throw in a couple of private reserves with trails and canopy suspension bridges (Heliconias), the best typical soda food in the country (Soda la Ceiba 11.4 km north on route 6), and a deluxe B&B with a French chef (Tenorio Lodge) and you’re getting there. Bijagua is the little town that’s the gateway to both parks and a fascinating slice of typical rural Costa Rica seemingly untouched compared with other areas. I feel a little guilty telling you about this unspoiled gem but it’s going to be discovered sooner or later so go sooner. Miravalles National Park and Tenorio National Park are both relatively undiscovered. Even the 10-30 people who arrive daily after a long mini-bus ride from Arenal each day to do hiking tours to the famous Celeste Waterfall are barely noticeable on the miles of trails. Both parks are described in detail on the links above but a couple of highlights are the aforementioned turquoise blue Celeste Waterfall, Lago Danta high in the cloud forest of Tenorio, and the waterfall on the Río Bijagua in Miravalles. 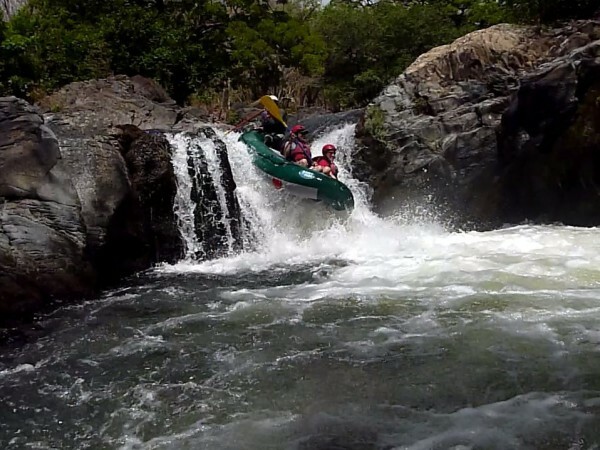 For a unique experience the “creeking” run (a term kayakers use for navigating smaller streams with barely enough water for the boat) down the Tenorio river is a little known tour that’s way better than many of the popular ones. 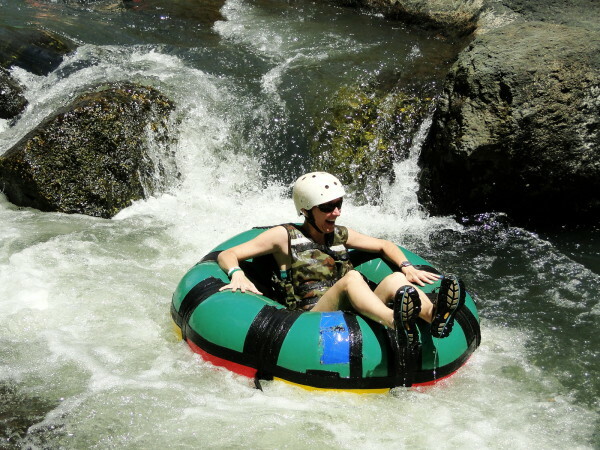 Small rafts are used and the waterway is pristine and natural as opposed to many of the big commercial rivers (especially around Arenal) where you feel a bit like you’re rafting through a neighborhood. The region straddles the continental divide and is a flyway for birds moving from the Pacific to Caribbean and vice versa and monkeys, pizotes and other wildlife are abundant. Hermosa Beach – Like Tamarindo in the More Fun itinerary we just sort of threw a dart at the map to come up with Playa Hermosa for this trip. You really can’t go wrong with any of the beaches in Guanacaste and they’re all within an hour or so of each other. If another playa sounds better by all means skip Hermosa. Hermosa is a great family beach and we’ve taken kids there frequently. 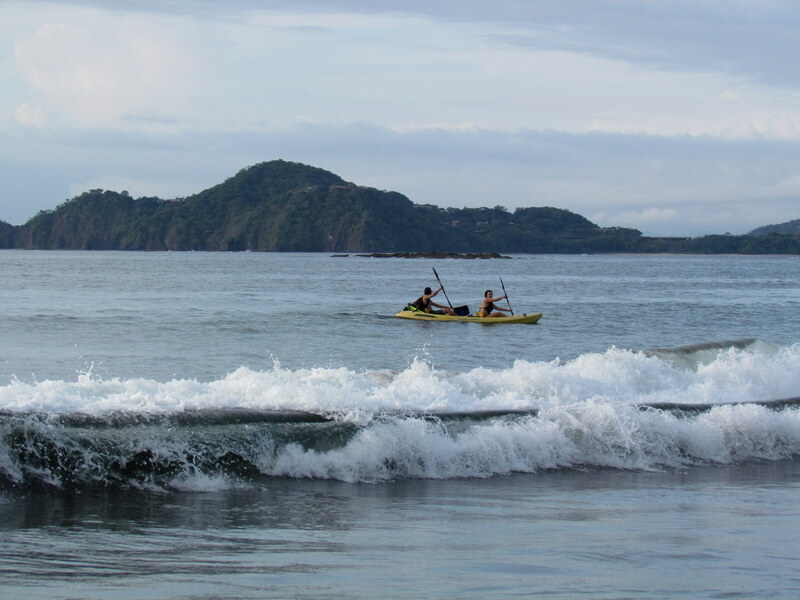 The protective bay keeps the Pacific surge at bay and the waves are small by Costa Rican standards. There’s nothing big enough to surf so that culture is is noticeably absent (that sort of sounds like I might have something against surfing – not at all it’s just a good way to describe the place). There are condos for rent on the hills on the south end and a small membership resort on the north end of the beach. In between are mostly small hotels, bars and restaurants. Not boring but quiet. We love it there. There are two hotels of particular note. On the south end tucked into the trees is the beachfront Bosque del Mar luxury boutique hotel which is every thing you want in a small deluxe hotel, restaurant and bar on the beach. Near the middle is El Velero which is where Sue and I first reached the beach on our bicycles 22 years ago. It’s mid priced, and although getting up there in years has a very sentimental spot in our hearts, Spanish architecture and absolutely the best Seafood BBQ in Costa Rica every Saturday night. If you stay it’s worth driving south to where the Hermosa road meets the Playas del Cocos road to the little Mexican restaurant. Best authentic Mexican in Costa Rica. 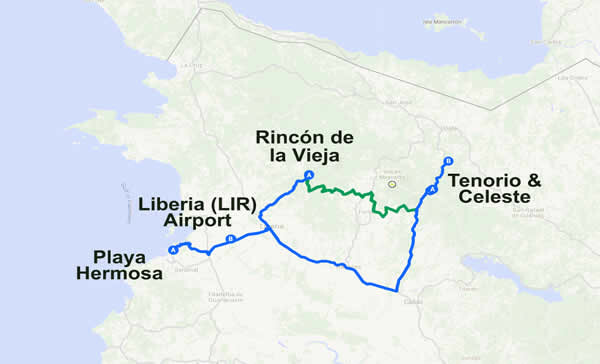 4WD note – the driving directions map on Google includes a 4WD route from Rincón to Bijagua shown in green. This is not for the faint of heart and gets continually more sketchy the closer you get to Bijagua. It’s gorgeous and a blast but I would not recommend doing the second half (the first part is gravel and you can bail out and head south from La Fortuna Bagaces on pavement to the main road) without a real 4WD (no RAV4’s or other city SUVs) and some experience behind the wheel. The second part of the route is just a squiggly line and does not represent the actual road. Google does not have the road on their maps and they keep erasing the gpx coordinates file that I upload. Caution – If you do this in a rental car you will be voiding your contract and you will be liable for any damage no matter what insurance you bought. CostaRicaGuide.com also publishes free printable maps of all of Costa Rica, and the hotels, resorts, restaurants and activities around Tenorio/Bijagua/Celeste that you can download to use when you don’t have GPS or cell signals, and print out if you like to have something in your pocket (choose your maps here). Fly in and out of LIR international airport in Liberia. It’s 4-5 hours closer to everything on this itinerary. This itinerary works best by far with a rental SUV. The destinations are undiscovered enough that tourist vans are relatively expensive (they don’t have anyone to pick up so they basically charge you for both ways). A lot of the things to see and do and places to eat are a few km away from the lodging so having wheels is nice. It can be done in taxis but will probably end up costing as much if not more than a rental so go for the convenience. Backpacker’s Travel Note – this itinerary can be done by public bus but you’ll spend a lot of time changing in Liberia (and possibly spending the night waiting for the only bus in the a.m.) and you’ll have to walk a lot or spend quite a bit on taxis. For example you can get a public bus to Curubande but that’s 7 km shy of the park entrance and lodges mentioned. Again you can get to Bijagua and there are hostels in town but you’ll have to figure out how to get to the Celeste trail head 8 km away. Longer is better but if it’s not possible you can get away with arriving relatively early at LIR spending one night at Guachipelín maybe fitting in a short hike to see the sunset. Do the adventure pass on day two and since it’s only about an hour and a half drive to Bijagua you can head there on the afternoon of the second day. Two nights at Bijagua and two on the beach so you could squeeze this into 6 days and 5 nights. You could also put the squeeze on at Bijagua and spend two nights at Guachipelín. Unless you’re just totally type A and have to go a million miles an hour or burst into flames we recommend at least 8 days and you definitely won’t get bored in 10. Does “Best of Both Worlds” Sound Like Fun?